Like all our prior poll posts, this post takes a moment to memorialize the results we received on the most recent blog poll. The readers' responses to the question "What's your attitude / preference / outlook on Cask Conditioned Beers?" are presented below. 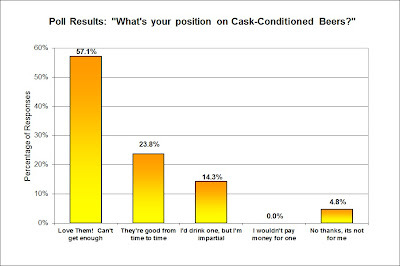 There is no ambiguity about how the readers feel about cask beer - it's a hit and for many, the more the better. The very skewed result may be the result of a growing trend in cask beers offered by commercial breweries (and the bars/pubs that sell them). Or it may be that the majority of our readers are homebrewers and anyone who is bottle conditioning their homebrew, is basically making the equivalent of cask beer anyways. While cask beer equipment is predominately sold to pubs and other professional venues, homebrewers are not left out in the cold. Places like UK Brewing Supplies have complete lines of firkins, pins, bungs, and beer engines if you're looking to serve traditional cask beer out of your home brewery. However, make sure you have plenty of thirsty drinkers on hand, as the 5-10 gallon casks should be turned over in about a week, or else it might start going downhill. Let us know the best place you've ever had cask beer. And if you are reading this, our next blog poll is up and awaiting your participation. "Beer is a living product"